Christmas is a time when separation from loved ones is most keenly felt. This was as true 100 years ago as it is today. Here we look at some of the Christmas cards sent by soldiers during the First World War, and how they helped to ease the pressures of life on the front line. 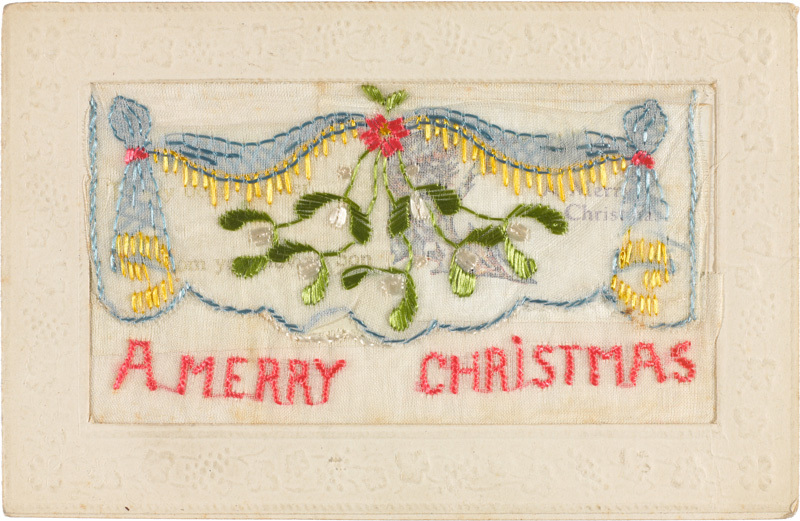 Decorative Christmas cards and postcards were hugely popular with soldiers during the First World War (1914-18). 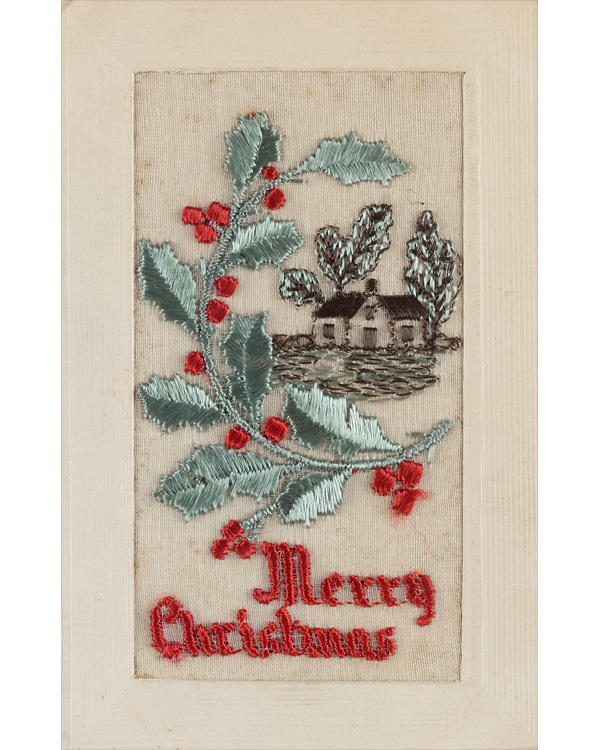 Embroidered postcards decorated with romantic motifs and local landmarks were especially sought-after. Some examples had a silk pocket which contained a written note or letter. It's likely that women, possibly refugees in the war-stricken areas of Belgium and France, undertook the embroidery. Initially, the work was done by hand. But towards the end of the war, machines were needed to produce enough cards to meet the high demand. 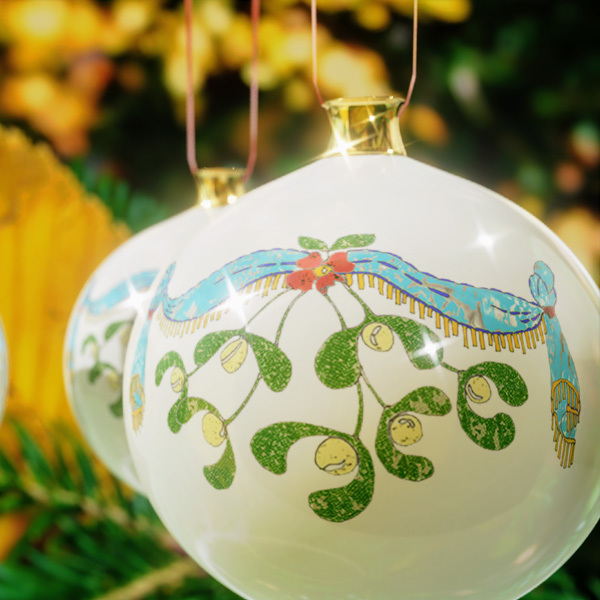 A limited edition Christmas bauble, designed exclusively for the National Army Museum, takes its inspiration from one of these 100-year-old embroidered silk postcards. The card was sent by Private Philip Poole to his mother Eliza in 1917. He was 20 years old at the time, undertaking transport duties with the Army Service Corps on the Western Front. His message simply wished his mother a Merry Christmas, 'From your loving son'. Holly Chrismas was a prolific correspondent during the war. He was known to send his wife Ada two or three postcards a day, in addition to regular letters, as a way of coping with their enforced separation. The cards were often intricately embroidered or conveyed romantic themes like beautiful women and flowers. Coming from a generation who are all too often characterised as inexpressive of their emotions, Holly’s messages to Ada are wonderfully full of sentiment. He signs one, ‘With tons of love and kisses,’ and another, ‘Farewell pet, be good, fondest love and heaps of kisses’. Many units chose to celebrate Christmas with a slice of regimental pride. Although cards like this had existed before 1914, the huge increase in men serving in the British Army during the First World War saw their popularity grow. 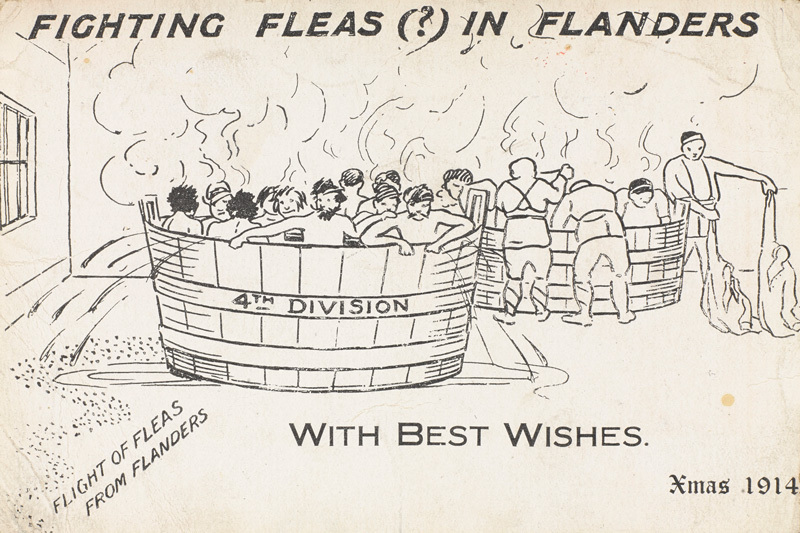 Some regimental cards parodied life on the front line, often using black humour to poke fun at the horrors of the trenches. 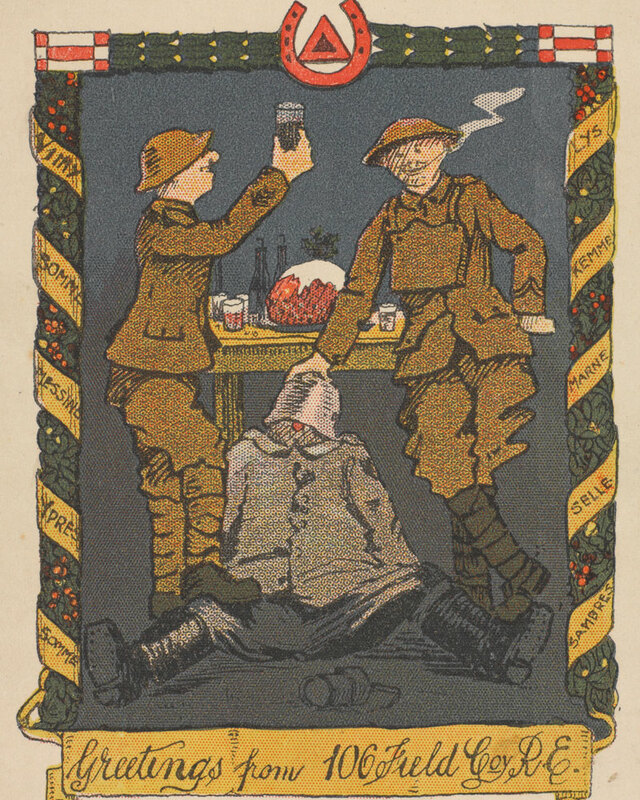 This lighter-hearted example from the Royal Engineers shows two Tommies celebrating with a passed-out German. The border is decorated with the battles and campaigns the unit had taken part in. Field Service postcards were a free and quick way of sending a message home. Unlike traditional letters, they were not subject to censorship because soldiers were only allowed to delete the appropriate phrases, and sign and date the message. Seasonal messages were, however, permitted during the festive period. GH Minn sent this Field Service postcard from Gallipoli in 1915. The optional phrases are crossed out and 'Christmas Greetings' is written at the top. 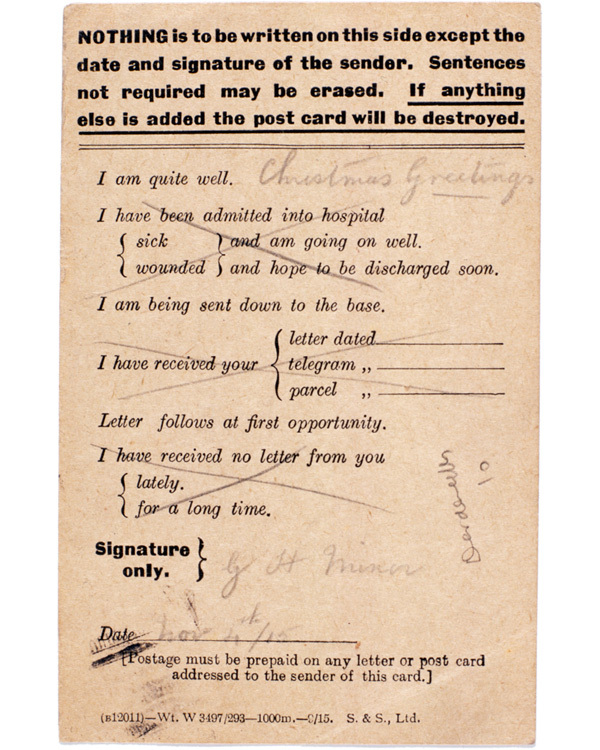 Although many soldiers felt that service postcards were too impersonal, sending messages home still provided soldiers with a welcome distraction. It created a sense of normality and familiarity, which was especially appreciated at Christmas.